Four months ago, I was one of those furious AirAsia passengers who got affected by the airline’s sudden flight cancellations. My flight from Singapore to Clark was moved from the 19th to the 20th of August. For a budget traveler like me, an extra day is already expensive and that would also mean I have to ask for additonal leave at work. I hate cancelled plans and I didn’t want all the hassle of requesting for a refund so I just agreed with the change in schedule. Philippines’ AirAsia has always taken great care when implementing any flight changes that may inconvenience you, our valued guest. Unfortunately, we have to suspend services between Clark and Singapore effective 1st August 2013 due to commercial considerations. There was no way that I was going to travel on or before July 31 because I already booked our hostel. I had no plans either of re-routing since I was already set with the trip. And I didn’t want to fly with them again because of the two incidents I mentioned above so I chose the last option, FULL REFUND. I have been hearing a lot of news about how slow the refund process of AirAsia is. Some even took months to get their refund. So what did I do? I immediately called their contact center and requested for a full refund as soon as possible. If you will read the email or the responses on twitter, they will ask you to file a case in their website. For my experience, the response from filing the case in their website will ask you to wait for 5 working days before they will be able to attend to your concern. Five days is already a long time especially if your travel date is just a month to go. There are more things to consider so immediate action is needed. And I bet they are also receiving a lot of cases so you wouldn’t even know when they will actually answer you. I revisited my emails and these are the exchanges between AirAsia and me: 1) They will send an auto response stating your case number and that you should wait for 5 working days for their response. 2) After all the agony of waiting, you will receive another email stating that they are already starting to validate your case. 3) Then another email will be sent to state that it has been validated and is in progress. 4) The last email will be that it has been submitted to the bank already. So what I did was I called their call center hotline. I waited for almost 20 minutes before I was able to connect to one of their agents. I felt bad because I almost shouted at the agent because of all my frustrations. I made sure that she escalated my concern to the concered departments since my flight was actually near and I would need the money immediately to book in another airline. What I also found so frustrating was that, the agents were telling me different things. The second time I called and made a follow up, the agent told me that the money was already in the bank. When I called again a week after, the agent told me that the concerned departments were still processing my request and they will send me an email when it has been transfered to the bank. 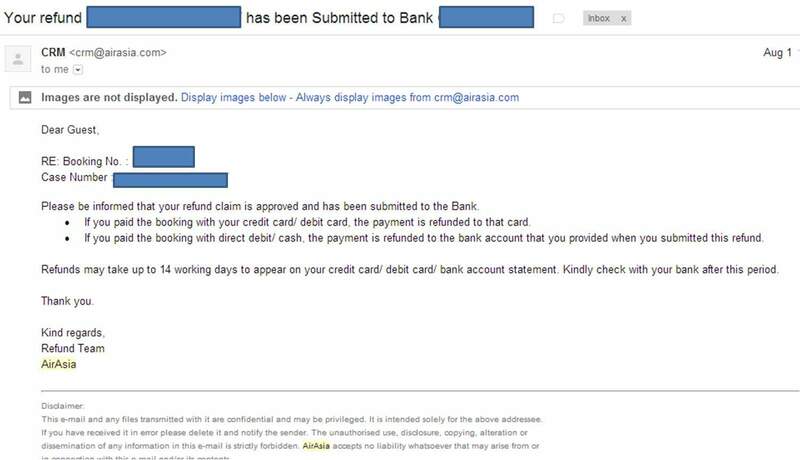 It took them one month just to validate and process the refund request. By the time the money was reflected in my credit card, I was already in Singapore. It took them 1 1/2 months to complete the process of my request. And I bet, if I haven’t called their agents and requested for immediate refund several times, I could have been waiting for nothing. Requesting for a refund will entail a lot of patience from your end but you have to be so that you’ll get what is due. Constantly call them and ask for updates. That way, they will be obliged to escalate your concern. And yes, always ask for the agents name or employee number and request for an email immediately after your conversation. That way, you’ll be able to track down your follow ups and you’ll have a back up just in case you want to tell them that their refund process is taking longer than the agreed time. Good luck!